Description: Diner style with casual tables in booths and tiles on the walls with and a varied but meat-heavy and not particularly diet-friendly menu ranging from jalapeno burgers to buffalo wings to chilli dogs and pulled pork sandwiches. Oh, and there's a salad. The restaurant is quite small, nestled among boutiques and cafes on London's trendy Marchmont Street. Reason for visit: Dinner with a friend who lives near here; she recently moved so we wanted to try somewhere new and local. 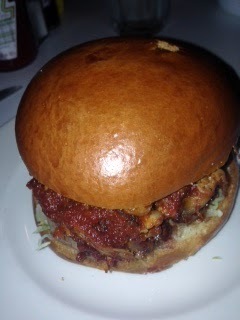 I ate: pulled pork burger, £8.50. I love pulled pork but have never tried it in a burger before so couldn't resist. My companions ate: Cheeseburger, £7.50, and vegetarian burger, £7.75, which consists of a large portobellow mushroom, halloumi cheese (though she is vegan so skipped this), plus lettuce, tomato, cucumber, coriander oil and mayo (again not for the vegans). The only other vegetarian dishes on the menu are side orders- mac and cheese, jalapeno peppers, fries and coleslaw, all of which together would make a meal, but other than the fries none of them are suitable for vegans. The food was: My burger was excellent, from the brioche bun to the shredded pork in BBQ sauce - the taste complemented the juicy burger perfectly. My friends enjoyed their meals too. None of us ordered the milkshakes though, which given the name I imagine is a speciality here. The atmosphere/service was: There was a nice level of bustle which comes from being a relatively small restaurant with people coming and going - it's not the sort of place you linger after a meal, and we were going on to the cinema afterwards - so it is the perfect place to grab dinner first. The waitress was friendly and we didn't have to wait long for our food. Price range/value for money: Good; while the fries cost extra, there are two sizes - £1.95 for small and £2.95 for large, so for an extra two quid you can't really complain, and the burgers are large and very filling. A standard burger is £6.50 which is pretty good for a burger bar like this in central London. Would I recommend it? Yes, it was a nice place- my first visit and it would be nice to see a couple more of these open in other parts of London. I definitely recommend the pulled pork burger which you don't see on menus very often.